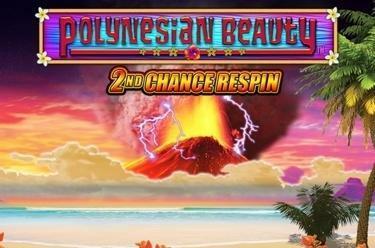 Play Polynesian Beauty™ – 2nd Chance Respin online for free now! Get to know our mesmerizing Hula Girl across five reels and up to 20 win lines or 243 winning patterns. With a little luck, she’ll show you how to get your hands on tremendous treasures! The excitement will increase further if several volcanos erupt on the screen. But fear not, they’re full of Twists! At Polynesian Beauty™ – 2nd Chance Respin, three or more matching symbols will make you a winner. They must simply appear side by side, from left to right, on one of the selected win lines or winning patterns. The Tiki symbol has the highest win value. 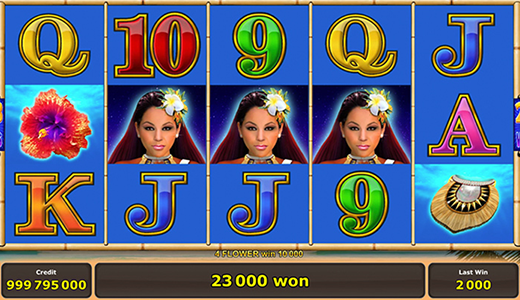 The Hula Girl can appear on reels two, three and four, and it can substitute for any other symbol (except for the Volcano symbol) to complete winning combos. Three or more Volcano symbols from left to right on adjacent reels land you additional free games, in which you can clean up with dazzling Twist wins! The type of free game depends on whether you play with 243 winning patterns or up to 20 win lines. In this game mode, free games will be triggered by every Scatter win or at random following a spin. During the free games, all winnings that include a Wild symbol (Hula Girl) will be multiplied by the multiplier in the feature either you chose or was chosen at random (Mystery Choice). Depending on the feature, between eight and 18 free games with a multiplier of x3 to x30 are possible. 2nd Chance Respin: If a Hula Girl (Wild) appears on the reels during the free games without being part of a win, it will expand. All reels with a Hula Girl symbol will then be fixed in place, and the reels will spin again. In this second-chance game, further free games can be triggered by Scatter wins! In this mode, Scatter wins always trigger 15 free games. They may also begin at random following a spin. If you land winnings in the free games that feature one or more Hula Girl symbols (Wild), a x2, x3 or x5 multiplier will be activated. Additional free games can be triggered in the free games at random and/or by landing Scatter wins. Need a holiday? Then this is the slot game for you! Polynesian Beauty™ – 2nd Chance Respin not only gives you the chance to soak up the sun and get a taste of life on a Pacific island. With a little luck, you can also load up on Twists that will trump even the beauty of Hawaii and Tuvalu! The choice is yours: 20 win lines or 243 winning patterns?